Norco offers a full array of service and repair items for battery and battery charger service and repair. 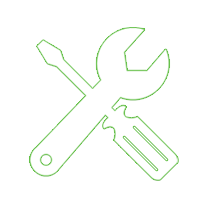 We also offer a lineup of value-added maintenance products such as Single-Point Watering systems, preventative maintenance checks and service contracts. Choose from hundreds of quality maintenance, repair and replacement parts including hard-to-find components, batteries and chargers, and all fitted and serviced by our own OEM certified engineers if required. With over 30 years of experience in the battery industry, NORCO’s unrivalled expertise means we can carry out battery servicing & repairs on all makes & models of battery. From battery topping to full maintained battery fleet management NORCO has the ability to provide a solution whatever your requirement. As an independent company NORCO will provide you with the most cost effective repair available on any make of battery. 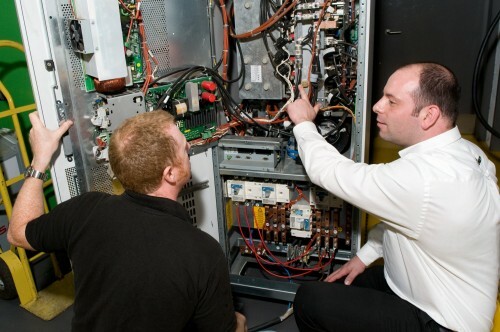 Working closely with our customers, our engineers provide support through planned maintenance in line with manufacturers’ recommendations, fault finding and repair to ensure the condition of your UPS equipment at all times. Our Emergency Fault Fast Response Service (24/7) is offered both on and offshore to ensure that any downtime is kept to an absolute minimum. Our Service Team work with dedicated onshore support which gives access to a fast turnaround on PCB repair, bespoke system redesign and retrofit solutions where required. As our Norco UPS Engineers are trained both in-house and at factory by our valued UPS supply partners, we are able to service a wide range of UPS systems. We aim to deliver the best power solution to suit customer needs capable of delivering up to 1250kVA with the use of reliable power generator sets from variety of established manufacturers including SDMO, FG Wilson, Pramac, Himoinsa and Caterpillar with a wide selection of generator engines as well as full generator customisation, extended base tanks, frequency switches and remote PC indication and telemetry via GSM and Ethernet. We can also supply diesel power generators to the offshore Oil & Gas industry reflecting the latest safety and weather proof standards as well as offshore Lifting Capability to D.N. V. 2.7.1, Third Party Offshore Approval, Remote Emergency Shutdown System, Fire and Gas Detection Systems and Fire and Gas Extinguishing Systems. Every power generator installation can be extended for service maintenance packages to allow smooth generator operation. We are also capable of generator panel upgrades and refurbishment plans incorporating the latest direct interface microprocessor based modules with full engine management facilities. Programmable logic controllers for more complex operations are also available. 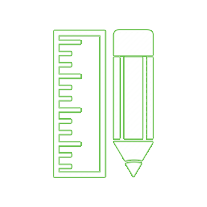 A team of design engineers are available to our customers to carry out bespoke design. The design team includes project managers, software, firmware, electronic and electrical engineers, allowing the tailoring of all aspects of the charger design ranging from panel layout to high level software protocols. The team’s design skills are used to optimise the internal layout panels, set out the power distribution system, manage the cable entry, and meet the required IP rating and final installation requirements. 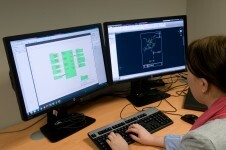 The layout and system wiring is captured using AutoCAD Electrical before a construction pack is passed to manufacturing. The design team are also available to carry out power electronics design specifically for a customer. 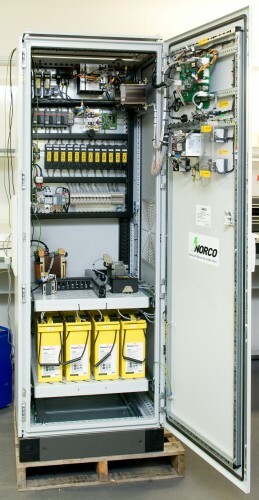 Norco is able to repair faulty PCB assemblies from a range of equipment including, but not limited to, power supplies, motor drives, UPSs or battery chargers. This enables equipment deemed obsolete by the manufacturers to be repaired and thereby extending its life. This is achieved by using our knowledge of power electronics to deduce the likely topology of the circuits and carry out fault finding down to component level. It is useful if customers are able to provide us with documentation such as system drawings, manuals or circuitry diagrams; it is also very helpful if the original system fault is known as it allows us to isolate the problem on more complex boards. In many cases, it is the power components and their drives which tend to fail and therefore are readily available and can be replaced. Components can also be sourced from the second hand market or in the extreme case; the function of the component can be redesigned using modern components. 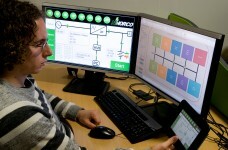 Faults with programmed devices such as embedded microprocessors or logic tend to be problematic as the equipment manufacturers either no longer have the code or are unwilling to release it. This can occasionally be overcome by using parts from other scrap boards or copying the programing data from working spares. Once repaired, the PCB assemblies are tested. If it is a power supply PCB, then it is possible to carry out a test under full load. If the repair is to a complex logic board, normally it is only possible to carry out the test on the repaired part of the circuit and the customer will need to carry out a full test when the unit is combined with the system. If required, a report can be provided to the customer detailing the fault found, the repair that was carried out and the testing that was performed. As with any repair service, until the fault has been found, it is not possible to determine whether the amount of time and/or materials required make a repair feasible. Norco approach this problem in one of two ways; if we are familiar with the PCB assembly, we will provide a fixed price cost to either repair or scrap the unit. If the unit is scrapped no charge will be made to the customer. Alternatively if we don’t know the assembly, or if it is important that the unit is repaired, then we will ask the customer for an order to cover the cost of investigation. If it is a simple problem we will repair the unit within the investigation time otherwise we will get back to the customer with an estimate of the cost of repair. Norco has invested in dedicated training facilities with our newly built training room and a fully equipped test bay. 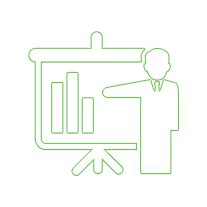 We have a wide range of equipment available to tailor courses around the client’s needs. 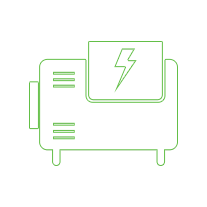 With 25 years’ experience within the battery and UPS industry, we are ideally placed to identify the training needs of the end user and can deliver bespoke training courses with both theory and practical elements.